The historical approaches to define the concept of strategic stability, especially during the Cold War, neither offer much insight and understanding of the dynamics of debate in the contemporary environment, nor do they offer a comprehensive grasp in this new age of weak uni-polarity or multi-polarity. Therefore, it is necessary to look into the concept in the backdrop of changed and changing international and regional dynamics. However, a historical review would definitely suggest how our predecessors thought about and dealt with nuclear revolution in the Cold War, and later, what approaches they adopted, and managed to strengthen the mutually perceived structure of stability in order to develop insights for future; and how we absorb that insight here in South Asia. To understand this complex concept, it is important to note that this concept grew out of what Micheal S. Gerson called “the logical progression in thinking about the consequences of nuclear revolution,” the challenges of surprise attack, and requirements of credible nuclear deterrence. However, in South Asian context, over time, along with above-mentioned inherited logical progression, there are certain new courses our comprehension has gone along with to meet the novel challenges that strategic stability faces in a different environment in this part of the world. The interpretation of ‘stability’ in contemporary environment of South Asia differs from that of the Cold War era, because the dynamics of international politics and environment and the factors which shape or may influence the environment have evolved and changed, so has the concept. There is no doubt that both Pakistan and India are rational actor models and several international accounts endorse this assertion. Both have gone through a positive trajectory of nuclear learning and are heading towards more maturity. Several crisis episodes such as 1998, 2001-2002 and 2008 suggest that both behaved rationally and did not allow things to get out of control. However, quite interestingly, in South Asia, the presence of Non-State-Actors (NSA) or Violent Extremist Organization (VEOs) and their ability and capacity to get these rational actors (Pakistan and India) into a crisis situation in a very short span of time remains large and alarming. This phenomenon, though a single factor which challenges the structure of stability, was prominent during the last two crises between Pakistan and India; Indian Parliament attack in December 2001 and subsequent military stand-off, and the Mumbai crisis of 2008. 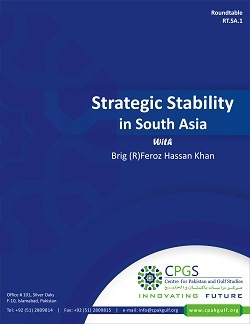 The classical notion of strategic stability thus cannot be applied to the South Asian region to define the dynamics of stability. Besides this, the stability-instability paradox, doctrinal innovations to fight a limited war under nuclear hangover, vertical proliferation and resulting arms race instability, issue of nuclear safety and security have given rise to inadvertence escalation or conflict, which may go well beyond the control of what little or nominal crisis management or conflict resolution mechanisms we have.